In the second book of his Life of Columba abbot Adomnan of Iona relates some details regarding the second and third voyages of the monk Cormac in search of ‘a desert place in the ocean’. 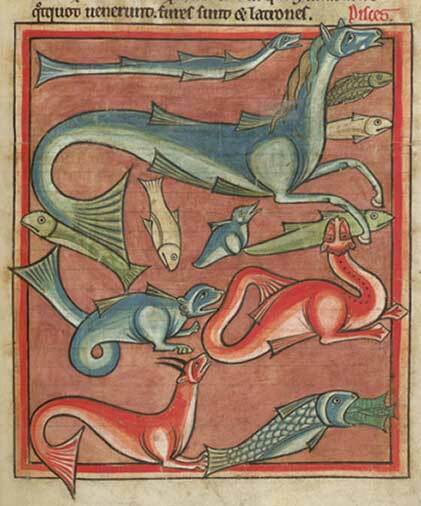 During the course of his third voyage, Cormac’s curach is driven into unexplored northerly latitudes where the fragile skin-covered vessel is assailed by a swarm of small but very aggressive marine animals: ‘Quae, ut hi qui inerant ibidem postea narrarunt, prope magnitudine ranarum aculeis permolestae non tamen uolatiles sed natatiles erant’ [As those that were present there related afterwards, these creatures were about the size of frogs, very injurious by reason of their stings, but they did not fly, they swam]. The aculei with which these mysterious creatures are equipped appear to be frontal spines or projections of some sort, and Adomnan’s reference to their lack of the power of flight suggests a comparison with the beaks of birds.